As vice president for information technology, John Primo has a front row seat to the increasingly technological education environment and the opportunities it presents students. As enrollment numbers increased over the last few years, Rose State’s internet connection became more strained. The 1 gigabit connection was becoming less sufficient for students, faculty and staff to perform necessary tasks. Internet connection was a critical resource, but technological dependence also posed a single point of liability. If connection was lost in an emergency situation, everything from student email and class assignments to financial aid and attendance records would be inaccessible. As more classes and vital records were moved online, bandwidth and security became crucial. Leaders at Rose State quickly identified areas of improvement and through a bond project, were able to secure funds to enhance campus technology. Rose State officials met with OneNet engineers, and together they developed a plan to perform significant connectivity upgrades. For the upgrades, OneNet would utilize the Oklahoma Community Anchor Network (OCAN), a statewide fiber network designed to improve bandwidth access to areas throughout the state. Rose State’s position along I-40 made connection to OCAN seamless, cost-effective and secure. This connection allowed Rose State to increase bandwidth to 10 gigabits, 10 times faster than their previous connection. 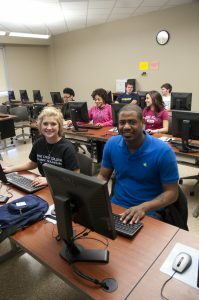 To ensure redundancy, OneNet provided the college with two OCAN connections from the east and west sides of campus through their data center and library. In case of an outage, Rose State can now run on one of the fiber connections until the network is restored. In Oklahoma, natural disasters are unpredictable, and although Rose State hopes to avoid an emergency situation, Primo is thankful they will always be prepared. OneNet has an unmatched commitment to Oklahoma higher education, and as colleges and universities become increasingly dependent on connectivity to perform basic functions in the classroom, our engineers are eager to meet the demands head-on. “OneNet staff has established a history as professional, courteous, and caring people who convey a sincere desire to help those they provide services to,” Primo said. In the current age, educational opportunities are now more readily available to all residents of Oklahoma, and technological initiatives have made Rose State accessible and relevant to the modern learner. “Information access is critical to higher education institutes in both academic and administrative capacities. OneNet is committed to making internet connectivity a secure and quick resource so that students, faculty and staff can effectively engage in our digital society,” said OneNet Executive Director Von Royal. As the face of higher education shifts to match a digital society, OneNet is uniquely positioned to provide resources to colleges and universities like Rose State who engage citizens from all Oklahoma communities. Rose State College’s technological initiatives are a reflection of the commitment education leaders have to making learning opportunities available to all Oklahomans.